A New Year and A New Start, but still a majority of people don’t know which way to GO! Majority of us start our DAY ONE of January with one strong and irresistible New Year Resolution, but after that it’s all postponed stories filled with excuses and us end up with no improvement and fulfilment, but as I said it is with majority of us and as inconvincible it sounds, I am in that minority that fulfils their resolutions. So today, on this new year we will make a new start and resolute to go DIGITAL for our maximum work activities. Yes, our resolution is to go DIGITAL, and this resolution should not be implied to Individually, we need to implement it as a resolution in our organization, institutes, schools, and Universities everywhere, then only we can succeed. So, the question is where to start? Well, organizations can start with converting all their activities of management from taking, making the report to transactions all through digital mode, this way paper will be saved and you can maintain the records in a clean way. Schools and Universities are one of the sectors in which the digitalization is needed the most, as they have to maintain the records of every student from the dozens of batches from the past till future with every single information about his/her academic records. Moreover, CBSE already made their resolution pre-New year to go fully Cashless and Digital from January 2017, in addition, state boards schools are also asked to go cashless and manage their records digitally. 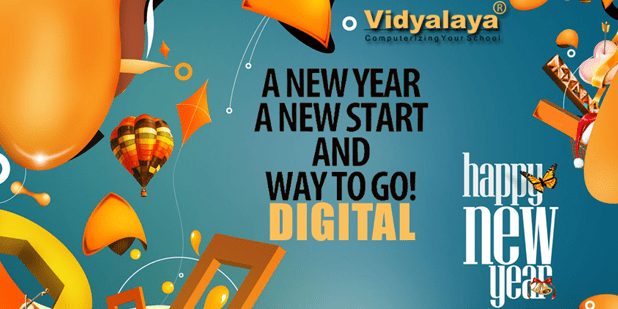 So, we as a School Management Software provider Team Vidyalaya take Resolution to provide every kind of support in order to implement Digital India concept successfully. And once again HAPPY NEW YEAR.